Bunker fuel supplier Maersk Oil Trading has leased oil storage capacity in Singapore. An A.P. Moller-Maersk spokesperson was reported to have confirmed the move to Reuters, while trade sources indicated the firm has taken 120,000 cubic meters (cbm) of space from the Tankstore oil terminal in the southeast Asian bunkering hub. That venture is slated to cater for a fifth of Maersk's global demand for IMO2020-compliant fuels, and Niels Henrik Lindegaard, Head of Maersk Oil Trading, told Ship & Bunker recently it was "looking into more bunkering facilities like this." 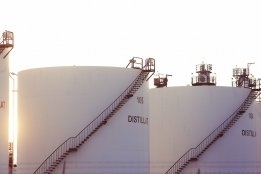 From January 1, 2020, the majority of the world's shipping fleet is expected to opt for marine distillates or VLSFO grades to meet the new global 0.50% sulfur cap rule. Sufficient supply of these fuel grades in ports worldwide is increasingly seen as an issue in the run up to the rule change.